Like us on Facebook or Follow on Twitter! After we got home from the great Iowa State Fair we had to rinse the heifers out and get them ready to “rough it” for a little bit. When we got Teardrop in to wash her Crystal decided that I needed to take a break from unpacking the trailer and help her get a picture of her and boy did we get a good one! 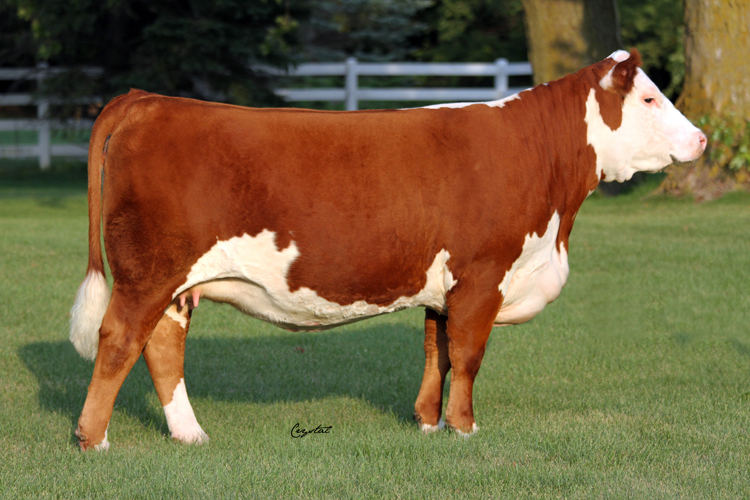 Teardrop is sired by the 2-time National Western Supreme Champion Hereford, Shock & Awe and is out of the Ginger Gal heifer that I won the 2005 JNHE with. She is moderate and powerful with length and style. Teardrop as you may recall won her class at the fair while getting a lot of looks in division. Her little full sister was second in class, we will post a picture of her later in the week. Females like Teardrop offer a very strong foundation and have a lot of traits that we feel will help us as we move forward. © 2019 JJB Cattle Comapny. All Rights Reserved.